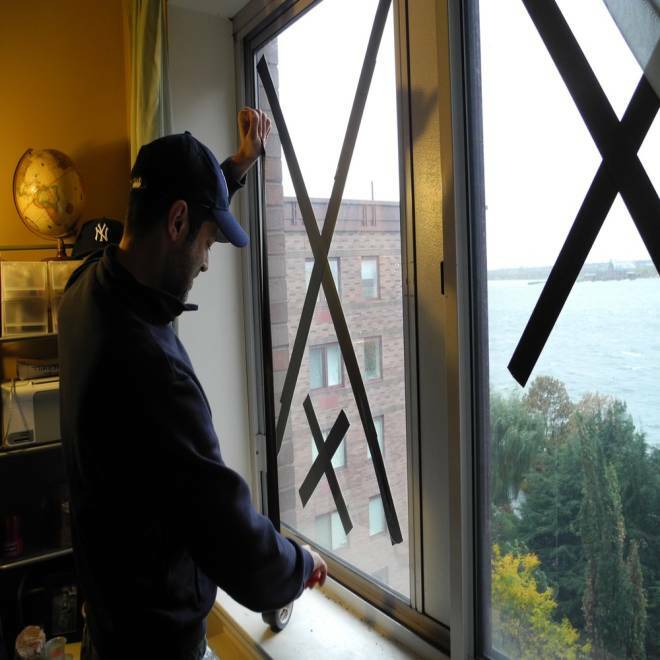 Laz Benitez puts duct tape on the window of the 9th-floor lower Manhattan apartment he shares with his wife, Annie Chambliss, early Monday. The couple decided to stay despite Mayor Michael Bloomberg's mandatory evacuation order because they felt they were safe and would not pose a concern for rescue workers. While large swathes of New York City were under mandatory evacuation orders Monday – a fact that police cars and vans with speakers loudly blared throughout the morning – many residents elected to defy the edict and hunker down in their homes. 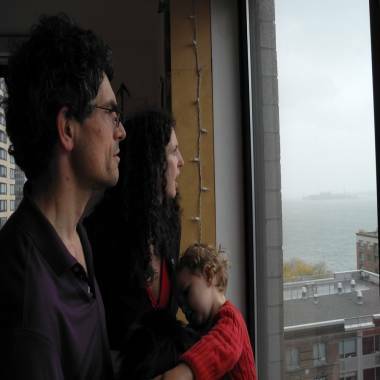 Annie Chambliss and Laz Benitez took their dog, Kallon, on one last pre-storm walk at midmorning before taping up their windows and holing up inside their lower Manhattan apartment overlooking the Hudson River. A block away, parents Claire Wladis and Nicholas Rennie did the same with their 21-month-old daughter, Iliana, in their 15th-floor flat. "We sort of decided it would probably be safer just to stay where we are," said Wladis, 34, a university math professor, noting that her relatives lived in other states that were expected to fare even worse during the storm. "We are not that high up and there's an internal hallway, so we figured if the winds got strong we'd just pull a mattress out there and camp out." Despite an evacuation order issued Sunday by the city's Mayor Michael Bloomberg, which covered some 375,000 people living in low-lying areas, it was clear Monday that many residents decided to stay put and take their chances when Hurricane Sandy reached shore. The neighborhood where the families NBC News interviewed live was quiet on Monday, but it wasn't a ghost town. Some people walked their dogs or jogged, while others stood at the waterfront watching the river rise. Some nearby businesses were boarded up, however, and many buildings had sandbags piled up around their entrances. Claire Wladis, 34, holding her 21-month-old daughter Iliana, and her husband, Nicholas Rennie, 45, look across the Hudson River toward New Jersey early Monday, trying to assess how high the water had risen. Only 3,000 people had sought refuge in city emergency shelters, Bloomberg said Monday at a late-morning briefing, though many others were likely staying at hotels or with friends or family. Wladis and Rennie said having a young child figured into their decision-making. The couple moved a small, cozy sleep tent for Iliana into a walk-in closet, away from the apartment windows facing the river, which was lapping over walkways amid a constant drizzle and powerful wind gusts during high tide. "I actually feel safer being able to go into internal hallways ... than say being in a shelter where she's maybe not sleeping and I'm chasing her around," said Rennie, a 45-year old literature professor, as Iliana crawled and ran around an apartment building lobby. Of Iliana's tent, he said: "She loved it. She didn't want to leave this morning." 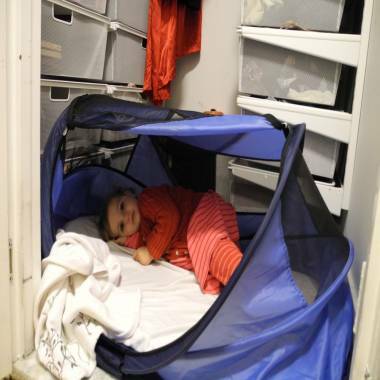 Iliana Wladis lays in her sleep tent, which her parents placed inside a closet for protection in case of high windows or other weather trouble during the storm. The couple figured they were well-prepared for what could be a lengthy stay inside: They stocked up on five days’ worth of nonperishable foods, bought a tarp, flashlights and candles, filled up the bathtub with water, moved computers and other valuable objects away from the windows, and charged their laptops and computer tablets. And, they had sleeping bags ready in case they lose power. They also had wet pads and food for their 12-year-old black Pomeranian, Little Bit, and plenty of toys and books for Iliana. They said they planned on letting Iliana play ball with Little Bit in the hallway and turning to real-life books to occupy their time if they lose all electricity. "I think if this was much worse, we would definitely have seriously considered going to a shelter or to somebody else's (place)," Wladis said, adding she felt the biggest risks were more likely to be "inconvenience, as long as you stay inside and don't go wandering off in the storm." Flights and trains canceled, schools, offices and Wall Street closed as Sandy bears down on the coast. NBC's Brian Mooar reports. Chambliss, 31, and Benitez, 41, made similar preparations for their 9th-floor apartment, but also bought thick foam and duct tape to cover their lone window. Though they had many offers to stay with friends in other parts of the city, cramming into a small apartment wasn’t an appealing prospect, especially with a dog. "When we evacuated last time (for last year's Hurricane Irene), it actually was worse off where we evacuated to," said Chambliss, who works in web communications, as she walked Kallon along the riverfront. "We'll probably be stranded wherever we are for a long time. We figured we'd rather be stuck in our own home." The couple did expect to lose power, and had fully charged all of their electronic gadgets. They also stocked up pans and pots in case of any water leaks, since they are on the top floor in their building. "We're not being reckless. We're being very cautious," said Benitez, who works in public relations, who was continuously monitoring TV news for updates on the storm. "We feel much safer here actually." Some politicians have taken a harsh tone in criticizing those who stayed behind. New Jersey Gov. Chris Christie on Monday called residents who did not follow evacuation orders in his state “both stupid and selfish.” Bloomberg took a milder tack on Sunday, asking city dwellers to leave if ordered to do so as not to endanger rescue workers. But Chambliss said blanket orders don’t take into account individual residents’ circumstances. Her comments were echoed by Wladis. Authorities continued their efforts to get the holdouts to leave on Monday, with police vans and cars equipped with speakers driving through the evacuation zone broadcasting warnings. "Please leave," said one message, while another warned that those who stayed were committing a Class D misdemeanor. A possible citation notwithstanding, Wladis and Rennie said they intended to make the most of the experience of riding out a hurricane.